Who wants to raise it to RM450? We got to paint the house. I don’t think it could get easier than that! 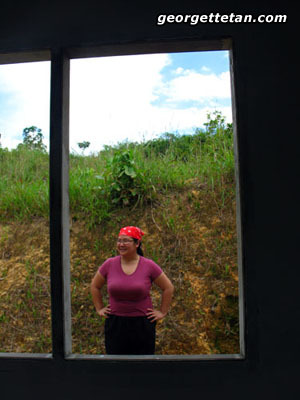 After introductions and signing the form, Eric put Paula and Maggie to work painting the undercoat on that bare spot of concrete you see in the photo above, and the whole back of the house. 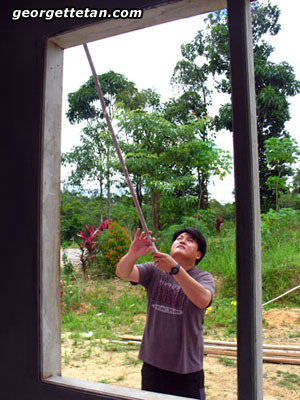 Painting a house is something just about everybody’s done before, so there wasn’t much brain or concentration required. The two girls outside occupied their brains by being as loud as a plane crash with whatever it was they were discussing. Meanwhile, Eric popped open a tub of peppermint ice cream paint for the living room. 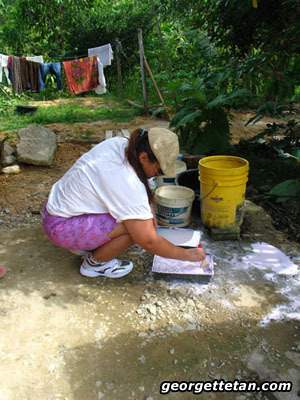 Once the paint’s been dispensed into paint trays, we got started with the living room. I didn’t take a photo of the finished work, but rest assured, it is thoroughly peppermint ice cream green. 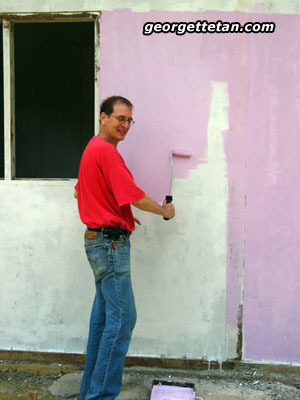 The four of us moved outside with a yam ice cream pale purple paint, covering walls Paula and Maggie worked on earlier. At some point, someone wondered about all the other people who worked on the house. When I was about to snap this photo, Robert said, “A world famous writer painted this house.” He worked as a house painter before too! We took a short break for lunch. Peggy actually bought a load of stuff so we didn’t have to drive off to find a cafe. After lunch, we got back to work. 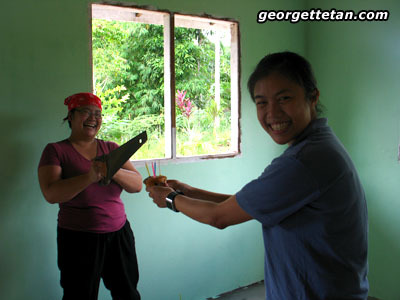 Maggie and Paula finished off the undercoat for the back of the house. House owner Emoi works on his back door. Peggy got me from inside the house while I was watching Paula and Maggie, and waiting to get started with the purple paint. She gets Henrick too, who is finishing up over on the side of the house. Paula washed the brushes and rollers after we were done with the outside. Apparently they don’t get running water, so Emoi had to go draw water out of a well. 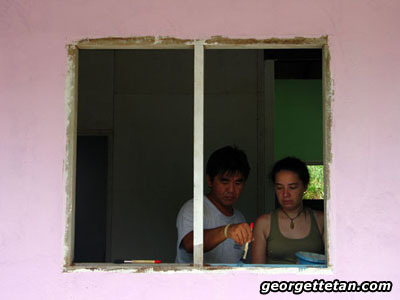 Eric gets Maggie started on the windows. 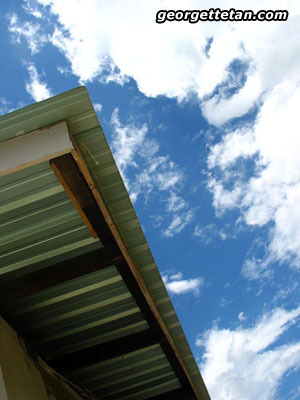 Blue to match the roof. Maggie and I comparing stains. Please note red circle. Since there was a birthday involved, there was a birthday cupcake and birthday song. I had to make do with a cutting implement. I snapped one last photo on the way out. Later on, I realised that the arrow on the sign pointed two ways. The next build is down the road from Emoi’s house. Work begins this week. On the whole, it was another enjoyable trip. We talked too loudly and laughed too much, but it made time fly. Oh, and we also hatched a couple of projects. This is what happens when creative people are stuck together for hours. I also can’t believe how fast this house came up. Has it even been two months? 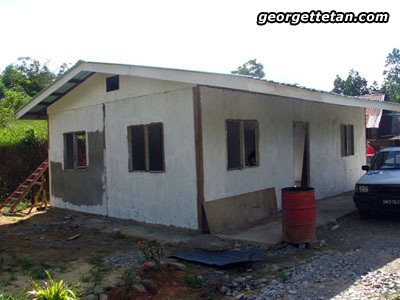 It’s quite exciting to know that Emoi and his family will be able to move out of their two room shack and into a nice and proper 2-bedroom house. I had more to say when I started, but I kinda forgot how to do this blogging thing. 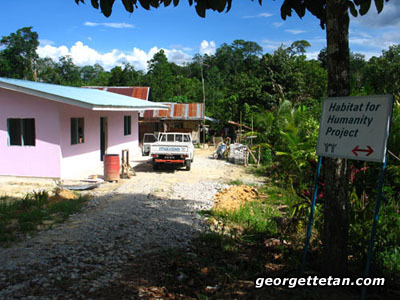 Hi there Georgette… got to know HfH through friends Calvin & Roy. I would like to join the next build. Started to circulate to every1 in the office about HfH too… hopefully they don sue me for harassment hahahah… Managed to blackmailed collected ~RM300 from colleagues. How & when can I pass it to you? ?